Where Do Supplements Fit In, In a Gout Diet? Dietary Supplements are defined by the U.S. Food and Drug Administration under the Dietary Supplement Health and Education Act (DSHEA) of 11994 as “a product taken by mouth that contains a “dietary ingredient” intended to supplement the diet. Dietary ingredients can consist of the following substances: vitamin, mineral, herb or other botanical, concentrate, metabolite, amino acid or an extract. Dietary supplements are typically comprised of natural ingredients which obviously makes them less likely to cause any negative side effects compared to gout medications like allopurinol or colchicine for example. I take plenty of dietary supplements every single day, from vitamin D, mostly in the winters and because I live in Canada where the sun rarely shines in wintertime, Milk Thistle for my liver, Apple Cider Vinegar to balance pH and avoid heartburn, Digestive Enzymes to aid the digestion process, Tart Cherry Extract to keep uric acid levels healthy ( because we don’t have fresh cherries year-round) and some other supplements that help supplement my gout diet. And that is the key my dear gout sufferers! Gout diet and food should be first. Supplements should never replace a good healthy gout diet and be a food substitute. Supplements will never replace all of the nutrients and health benefits of whole foods. Think of supplements basically as plugins for your nutrition gaps in your gout diet. Food contains not only vitamins and minerals but fiber, phytochemicals that work together to promote good health that simply cannot be duplicated with a pill or cocktail of supplements! But when you have a condition like we gout sufferers do and food sometimes falls short and doesn’t include essential nutrients then a supplement can help close the gap and provide the nutrition your body and/or condition like gout requires. Truth is supplements can help prevent deficiencies that can contribute to chronic conditions. Furthermore, plenty of studies have shown the health benefits of supplementing missing nutrients in the diet with dietary supplements. But the key is always to think food first and then supplement the gaps! 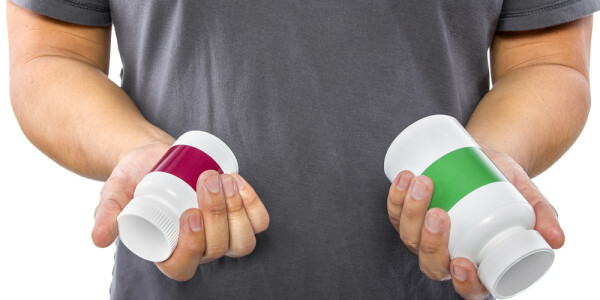 What Supplement to Choose for Gout? At the end you need to take note of your dietary habits and see if you are avoiding any entire food groups. Take dairy for example, if you are not eating any dairy then it’s wise to supplement with a calcium and vitamin D for your shortfall on dairy. We gout sufferers need to supplement on fighting to get those uric acid levels healthy, so naturally a cherry supplement can help maintain healthy uric acid levels for many, some more than others, of course the severity of one’s gout plays a big role as well. Tart cherries contain powerful antioxidants called anthocyanins which is what gives cherries that distinct red color. In addition, tart cherries are one of the richest sources of anthocyanins 1 and 2, which help to block pro-inflammatory COX-1 and COX-2 enzymes. For more evidence and studies on gout and cherries make sure to read my post on the subject. Cherries have been associated with lower levels of uric acid in studies, as well as a reduced number of gout attacks. There have also been other gout studies examining dietary supplements like vitamin C and skim milk powder that you can check out. When choosing a supplement there some things to consider. Firstly, try to pick a supplement that has been manufactured in a FDA compliant facility that follows “Current Good Manufacturing Practices”, you may notice the little logo on a bottle “cGMP”, this means that your supplement has been inspected and approved by the FDA. It also means that the supplement has gone through many tests for accuracy, potency and make sure the product is free from any contamination. When buying supplements it is always best to choose vegetarian capsules made from cellulose instead of gelatin which are actually made from the organs and tissues of animals. Yuk! Besides gelatin can raise uric acid levels since it’s animal-based. Make sure that the supplement bottle clearly indicates the manufacturer name and contact info. Usually the ones that hide their contact info, are hiding something else as well! Make sure the labels are informative and provide accurate information. Like any prescribed drugs, sometimes dietary supplements can also have side-effects but they are rarely as severe as medications. If you do experience a negative reaction to dietary supplements be sure to stop taking it immediately and contact your doctor. Dietary supplements, which are not regulated by the FDA, are marketed as a solution or preventative measure for a number of disorders including gout, or to supplement nutrients lacking in your diet. To safely receive the health benefits of taking dietary supplements, always consult with a physician before taking any supplement to help avoid negative side effects. Is COQ10 GOOD OR BAD FOR GOUT? Been suffering with gout for over 15 years. Diagnosed in my mid 20’s. As a result, no red meat whatsoever. I am on the highest dosage for meds and still my level are well above the average. I am in shape and recently started high impact exercising. I am finding I fatigue really fast during my workouts. As a result, I went to doctor and found out I have anemia as well. They call it runner hemolysis. I am wondering if the problem is from not being able to eat red meat which helps oxygenate the red blood cells which leads to fatigue. I am hoping you might be able to recommend a supplement to assist with my body giving out on me much faster than it should. Have you tried taking B12 and folic acid? I take B12 daily. Give it a try. Hi, I bought the nutrigout on amazon, I thought I saw somewhere I could get the cookbook free, how does that work? If you order off of Amazon, in the first email you should’ve gotten the ebook. Check your spam or junk folder in case it went there. If not email us via Amazon and we will make sure to get you a copy out. Can you tell me if you have any relationship between gout and collagen peptides? I recently started adding them to my morning beverage and have experienced my first gout attack. I am not taking any but hard to pinpoint that collagen peptide was directly responsible for your gout attack.It is animal based protein at the end so it can be. Not quite sure. I wonder if you can help me, I need a bit of advice. I’m a bit overwhelmed about all of the info out there about Fish Oils. I have also read your article about this on your website. Most Fish Oil capsules I have found, the capsules are made from either Bovine Gelatin or Fish Gelatine. Others just say Gelatin but then when I have researched the products further it says the Gelatin is Bovine Gelatin. Does taking Gelatin capsules from Bovine Gelatin or Fish Gelatin increase uric acid levels? Are purines in fish oils? when I have looked in to this I have read that there are no purines in fish oil only in the meat itself? I have also read that the fish oils should be molecularly distilled so that any toxins are removed but I have also read that fish oil that has been molecularly distilled is bad as it takes away the natural oils? I have read taking Fish oils is very important for people with Gout as it has anti-inflammatory properties and also is good for heart health but, I don’t want to purchase Fish Oil if the gelatin capsule used increases uric acid levels. I’m based in the UK so I don’t know if there are any Fish oil products you can recommend to me, it’s for my partner. I strongly recommend Marine D3 it is a very high quality omega 3 vegetarian supplement. I live in the UK and I have sufferd with what I believe is gout on and off for 2 years, I am male and 63 years old. I have been to my doctor a dozen times over the last two years and every time he tells me that I have not got gout and my blood uric acid are just within the range that they should be, I have also been checked for artritius as well which was also clear, and yet my hands are sore and swollen alot of the time, hot and burning, and very painfull, a few days after an attact they start to return to almost normal untill the next attack. I have changed my diet around quite alot to include more fruit, less carbs, I am tea total as well no alcohol at all, sugary drinks, and I have learned to avoid trigers like chocolate and such stuff and the attacs have got much better and not so offten now. Howerver my biggest problem is I am a full time wheelchair user as a result of Polio when I was 2 years old, I do as much exercise as I can manange from my chair, but it is not the same as a good work out but it is all I have got, I am just about to download your E-book for the help and giudence it can give me. I would like to try your Tart cherry extract, and the nutrigout, the problem is Amazon.co.uk do not stock them, is there anyway around this problem by say buying them from Amazon.com whould they ship them to the uk? or is there any other way around this problem. Sick of haveing flair ups. PS great website, fantasic help, great information, you know more information than my Doc which has helped me loads, but I have much more to learn, one step at a time. NutriGout unfortunately is not available as of yet since it needs regulatory approval there first but you can still buy it off of eBay.com and we can ship it to the UK within a week! I live in the UK and I have sufferd with what I believe is gout on and off for 2 years, I am male and 63 years old. I have been to my doctor a dozen times over the last two years and every time he tells me that I have not got gout and my blood uric acid are just within the range that they should be, I have also been checked for arthritis as well which was also clear, and yet my hands are sore and swollen alot of the time, hot and burning, and very painfull, a few days after an attact they start to return to almost normal untill the next attack. I have changed my diet around quite alot to include more fruit, less carbs, I am tea total as well no alcohol at all, sugary drinks, and I have learned to avoid triggers like chocolate and such stuff and the attacks have got much better and not so often now. Howerver my biggest problem is I am a full time wheelchair user as a result of Polio when I was 2 years old, I do as much exercise as I can manange from my chair, but it is not the same as a good work out but it is all I have got, I am just about to download your E-book for the help and guidance it can give me. I would like to try your Tart cherry extract, and the Nutrigout, the problem is Amazon.co.uk do not stock them, is there anyway around this problem by say buying them from Amazon.com whould they ship them to the UK? or is there any other way around this problem? Sick of having flair ups. PS: great website, fantasic help, great information, you know more information than my Doc which has helped me loads, but I have much more to learn, one step at a time. Good to see that you are taking action and taking the necessary steps to get your health back on track. Yes we do ship in UK via eBay.com, you can order NutriGout and Tart Cherry Extract from there and it should be at your doorstep within 10 days. But soon we should be selling on Amazon UK and Europe. It’s been a good while since I’ve had an attack of Gout but it arrived back in anger overnight/today. I’ve not researched much in the last 2 years but I landed on your excellent site today. A brilliant source of everything you need to know about Gout, thank you. I was on top of it. I’m on 400mg Allopurinol daily and ‘had’ been taking both a Cherry Supplement (Cherry Active) and Celery Seed. I’ve relaxed the Cherry & Celery supplements and believe that this coupled with an excessive festive period has brought on a very severe attack. I will go back to my old routine of taking supplements, continue with Allopurinol and perhaps extend to use Nutri Gout + Apple Cider Vinegar supplement. I can’t seem to find Nutri Gout available in the UK. I’ve ordered a couple of bottles from US to try it out. Can you advise when/how/if it’s readily available in the UK?? I’d also be interested to find out how your recommended Tart Cherry extract compares to Cherry Active? I running low on Cherry Active so will need to order some new ones soon. I may try your recommendation given how helpful I’ve found the website. Yes it is important to watch what you eat as a gout sufferer for life! Gout attack can hit at anytime even with one bad day of eating or night out with friends having a few drinks. Supplements are important in supplementing your gout diet. 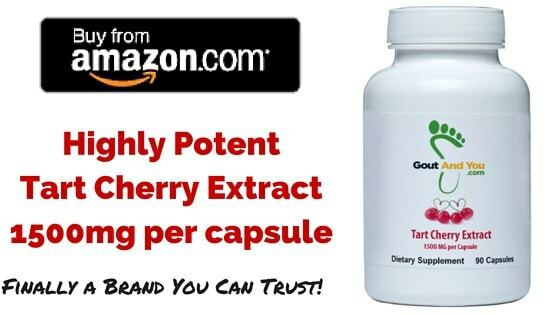 GoutandYou’s Tart Cherry Extract is a highly potent formulation, I can’t speak about Cherry Active though. Both NutriGout and Tart Cherry Extract are available from eBay.com and shipping is quick in the UK. Plus the more you buy the more you save on eBay. What is your opinion on Vitamin C to lower u levels? I see articles saying it helps, and some say that it doesn’t. Maddening! Studies have shown it helps and many gout sufferers report a benefit as well. I’d include it in my diet! I am a first time user of NutriGout. How long can I take the recommended dosage? NutriGout is a dietary supplement. It’s meant to supplement your diet where you are most weak. Which is managing uric acid levels and keeping them healthy. So in essence you want take this indefinitely. You can take 1-2 capsules daily so 1 bottle can last anywhere from 30 to 60 days. I personally will take it for the rest of my life, plus I take Tart Cherry Extract, Apple Cider Vinegar, a digestive supplement, vitamin D.
I am a gout sufferer & would like to explore natural remedies before committing to life long daily drugs such as Allopurinol. I would like to try nutrigout supplements, I live in Hong Kong & tried purchasing via Amazon, however it states that Amazon does not deliver Nutirgout to Hong Kong. Wondering if I can purchase via any other channel ? Any suggestions would be much appreciated. Yes you can purchase NutriGout and Tart Cherry Extract both on Ebay.com. We ship internationally everywhere in the world and our shipping rates are extremely fair. I just had my first gout attack. as a resuly, I was directed to your website. like you, I’m 5’11” and 225+ pounds, so it appears that we live simialr lives. A quick question, the Tart Cherry Extract you endorse, why isn’t it available on Amazon.ca? Any time I have tried to purchase anything on Amazon.com, I’m blocked from having it sent here in the Great White North. It will be available in couple of weeks via Ebay! Stay tuned! Spiro, just diagnosed with gout. I was on a low carb diet and I will change my diet going forward. I only had one episode. Would you suggest taking a Tart Cherry Supplement daily (if so how much) or wait until an episode were to happen again? Tart Cherry would be a dietary supplement you take help keep uric acid levels healthy, don’t think of it as a cure, it is a food at the end of the day, whether you eat cherries or take tart cherry extract, it has the same health benefit. Advantage of the taking the supplement is obviously more convenient, each capsule has a higher concentration and you skip the sugar intake of consuming cherries. How much you should take all depends on you and you should consult your doctor just in case you are taking any other medication that may affect it.